The explosion of digital, the empowered customer, and the acceleration of innovation are having a profound impact on customer experiences and expectations. Driving customer demand no longer relies on the best creative copy or the most entertaining tag-lines. It relies on an analytical, psychological, and perhaps even anthropological understanding of the customer. Companies can no longer rely on “the way things have always been done” to generate demand. Instead, they must find new, innovative ways to engage consumers. Many brands are realizing the first step of innovation is re-imagining the entire organizational structure – aka internal disruption. On deck to ignite this change is a special breed of marketer: the Transformational CMO. Bruce Rogers, the Chief Insights Officer of Forbes and leader of Forbes’ CMO Practice, recently provided insight into the unique skill set of Transformational CMOs, and how it differentiates them from the rest of the pack. 1) What are the tools in my marketing toolbox that have the greatest impact on customers? 2) How do the marketing tools interact with the other functional tools to drive overall business outcomes? 3) And how do I transform the entire enterprise to create a more seamless and value creating experience for the customer? Here are the 7 key characteristics and/or skills a Transformational CMO must possess. Transformational CMOs must have an understanding of lean and agile principles, and the ability to apply those principles across all systems and strategies. The “always be shipping” approach must be aligned across departments—IT can’t run on two-week sprints while Marketing runs on six-month “marathons”. Transformational CMOs are results driven and measure success with KPIs clearly linked to business performance. These CMOs have an in-depth understanding of business operations, an analytical approach to problem solving, and the ability to inspire others to action. They build a culture of execution. In addition to partnering with the CEO to grow the business, it is the Transformational CMO’s responsibility to break down organizational silos and bring internal alignment to departments and technology stacks. By quickly identifying and resolving time wasters and bottlenecks, Transformational CMOs are able to build momentum and drive growth. Transformational CMOs use their understanding of Marketing Technology software to assess how it relates to the distinct needs of the organization.Technology stacks should integrate across departments to create a comprehensive customer view. With 3,874 marketing technology solutions, this is becoming a more daunting task than ever. Does the software align and connect to your existing systems? Does it integrate seamlessly with other business applications? Does it effectively drive customer awareness? In order to lead organizational change, the CMO must be able – not just willing – to work with multiple stakeholders, managers, and teams. From partnering with HR on Employer Branding to working with customer service to QA testing new products/services to compiling and analyzing data, Transformational CMOs work closely with other departments. They have authentic and frequent interactions with IT, HR, and Finance to ensure the enterprise is creating a seamless and valuable customer experience. Transformational CMOs go beyond just crunching the data; they actually talk to the customer and perform customer discovery. They ask, “What, if anything, could we do better?” These CMOs look beyond just marketing metrics and review how the entire enterprise is engaging the customer. By developing a deep understanding of pain points and the overall customer journey, Transformational CMOs are able to create a simple and compelling brand story that makes customers want to engage. As Rogers points out, it’s much easier and less complicated to cut costs than it is to drive topline growth. Not only is this task challenging, it is one of the most vital to transformational change and perhaps even moving to the corner office. Rogers recommends hiring a CMO that can step into a CEO role to get more value out of the marketing department. In addition to possessing these skills and abilities, Transformational CMOs have 3 major obstacles to overcome: Simplicity in Story, Clarity in Strategy, and Alignment in Systems. 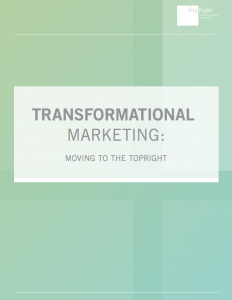 Based on our collective experiences helping brands move to the TopRight corner of the market, we have compiled an ebook to help you ignite transformational change within your organization. Dave believes in putting ROI at the center everything marketing does. As a leading authority on applying transformational marketing principles, organizations seek out Dave to help them develop compelling marketing and sales strategies. Dave Sutton is a leading authority today on Transformational Marketing– enabling businesses to reach, connect and engage with customers in a way that gives them a reason to care, a reason to buy, a reason to advocate and, most important of all, a reason to stay. He is the founder of TopRight, LLC– a Transformational Marketing firm that helps companies move to the top right quadrant of their competitive frame, and corner the markets where they choose to compete. TopRight’s 3S Playbook model of the right Story, the right Strategy, and the right Systems turns sales transactions into customer experiences that connect and communicate why you do what you do and what difference it makes for your customers. Dave is also the co-author of Enterprise Marketing Management: The New Science of Marketing- the ground-breaking book considered to be the definitive statement of a new business discipline designed to create sustained, profitable, organic growth. Founder Marketing Scientists LLC July 2003 – January 2007 (3 years 7 months) Co-Author of Enterprise Marketing Management - The New Science of Marketing (John Wiley & Sons). This ground-breaking book puts ROI at the center of everything Marketing does enabling companies to create sustained, profitable, organic growth. CEO and President Inforte Corporation (acquired by Business & Decision) December 2003 – March 2006 (2 years 4 months) Inforte Corporation is a leading CRM, e-Commerce and Analytics technology consulting firm that specializes in the development of sales and marketing strategies and solutions for Global 2000 companies. In 1999, Inforte was recognized as one of the fastest growing technology companies in the country coming in at #14 on the Inc. 500 and the firm successfully came public in Feb 2000. CEO Zyman Group (acquired by MDC Partners) May 2001 – July 2003 (2 years 3 months) Zyman Group is a strategic marketing consultancy that helps businesses succeed by applying the world-class marketing principles, methods and processes of Sergio Zyman, former Chief Marketing Officer of the Coca-Cola Company. Value is created for clients through an integrated offering of hands-on consulting, consumer insights generation, marketing execution guidance and return on marketing investment analysis. EVP, Strategy Inforte 1999 – 2001 (2 years) Inforte Corporation is a leading CRM, e-Commerce and Analytics technology consulting firm that specializes in the development of sales and marketing strategies and solutions for Global 2000 companies. In 1999, Inforte was recognized as one of the fastest growing technology companies in the country coming in at #14 on the Inc. 500 and the firm successfully came public in Feb 2000.